Penfolds have been in operation since 1844 and are Australia's most prestigious winery with products that are respected the world over. Penfolds wines are the most traded wine on the wine auction market by volume and many have gone up in price over the last few decades, sometimes by extraordinary amounts. Penfolds have two main releases of their range of wines. It used to be in April but was changed in 2014 to October (with 2014 seeing a dual release). Wine tasting reviews of (2013) Penfolds release wines can be found online by multi-award winning wine writer Tyson Stellzer. 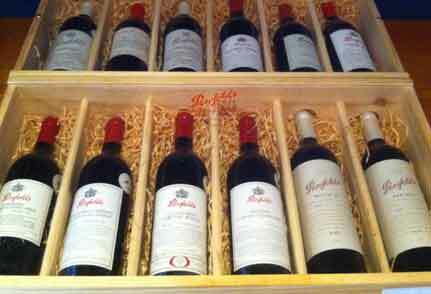 This is a fantastic service that Penfolds offers for owners of Penfolds wines that are 15 years or older. You can take along your wine to a clinic and have is assessed by a winemaker, and if necessary, it will be opened then tasted, topped up with the current vintage and recapsuled right in front of you. The Penfolds Re-corking clinic dates in Australia for 2018 will be in November with specific dates and locations being released soon. Penfolds Grange is the most sought after premium wine in Australia. With an interesting history of consistent quality in the face of adversity and a pedigree going back to 1951, it accounts for around 30% of the turnover of the Australian Wine Auction market. Grange couldn't be given away to start with.. literally.. many of the early vintages of Penfolds Grange were given to wine societies and wine people all around Australia including nearly 1800 bottles of the 1951 vintage (pictured left) today worth over $51,000 per bottle. Today, most Grange, except for exceptional and rare vintages sells between $300 and $600 and, yes, that is less than you pay for it on release. A rundown on investment facts and the latest penfolds Grange values . Complete vintage collections spanning 1951 to the present day are worth around $160,000 per set. Answers to Penfolds Grange frequently asked questions. "..a fantastic wine that ages with grace and harmony, a pleasure to drink.."
Penfolds flagship Cabernet Sauvignon also has a fascinating history. After only six vintages, in 1969, it was agreed to discontinue production because of a shortage of quality cabernet fruit and allocate it for use in Bin 389 instead. But with the splendid 1976 vintage, it was decided to dust off the labels and return it to the market. It has been a stable auction favorite for decades since and has recently enjoyed a steep rise in demand from China. Demand exceeded supply and any Bin 707 that came to auction was bid up quickly, trading at three times its retail value at one stage. However, the latest release of Bin 707, at more than the auction price, has seen it stabilise and contract back to 2009 - 2010 pricing. Small batches of experimental, one off, wines were crafted by the Penfolds winemakers to shadow the forging of a Grange. These "Special bin reds" (such as the 1962 Bin 60a, the 1967 Bin 7 and 1996 Block 42) have, over the decades, given rise to wines of such subliminal beauty that they enter the halls of legend and firmly place Penfolds as a leader in the top rank of the worlds key wine estates. Listed alongside the famous and almost impossible to get 1945 Chateau Mouton Rothschild, 1961 Chateau Latour and 1959 Domaine Romanee Conti Richebourg and lauded as one of the greatest ever wines to try before you die, Penfolds 1962 Bin 60a still comes up at auction on occasion for anywhere between $3000 to $6000 per bottle. An unbelievable bargain by international standards. There are many different special bin wines and each one has a unique and special story to tell and all are a wine collectors dream. Copyright ©2018 Mark Wickman, All Rights Reserved.